This tool is located on the Developer tab ribbon in Word. Then you will see something very similar to the image above, where you can select to enable your Developer tab. In the bottom of the View pane click the checkbox for displaying the Developer tab. 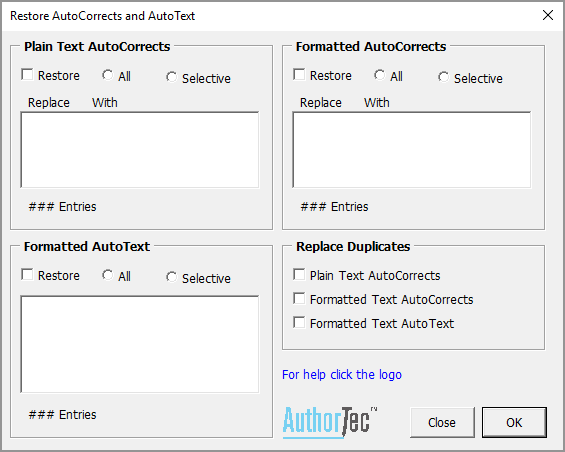 AuthorTec AutoCorrect performs two major tasks. All of these functions can be performed on multiple files and saves you from having to perform the tasks manually, one file at a time. There are two types of AutoCorrect entries that this add-in can backup and restore, Plain Text AutoCorrect entries and Formatted Text AutoCorrect entries. The add-in also can backup and restore AutoText entries. WHY NOT JUST MAKE A BACKUP COPY OF THE NORMAL TEMPLATE AND THE ACL FILE FROM ONE COMPUTER, AND REPLACE THEM ON THE OTHER COMPUTER? 1) ACL files are not compatible between Windows and Mac environments and in some cases, are not compatible between versions of Office. 2) Fully replacing either the ACL or Normal template, destroys any customizations that existed in those files on the other computer. The Plain Text AutoCorrect Library (ACL) is limited to 65,536 entries. At some point in time as you continue to add custom entries, it is rare, but you could reach that maximum. This add-in will warn you when you are approaching that limit and it does so because Word will unceremoniously crash if you exceed the ACL limitation. So, keep an eye on how many entries you currently have in your existing ACL library and how many you might be adding individually or in batch when using the restore function of this add-in. The AutoCorrect and AutoText entries can be backed up by marking the "Backup" checkboxes and then marking either "All" or "Selective" button. If "Selective" is chosen, the scrollable list of the entries to mark is enabled, otherwise it is disabled. Multiple consecutive entries can be marked by holding down the Shift key when selecting the first and last entry, otherwise just scroll the list and select the specific entries to back up by clicking on them. Selected entries become highlighted in blue. As mention above, if the "All" button is marked, the scrollable list of entries is locked. If you had begun selecting individual entries and then changed your mind and decided to back up "All" entries, you don't have to clear the individually selected entries that are highlighted in blue. Marking the "All" button overrides anything left selectively highlighted. When ready, click the OK button. You will be asked to point the folder where the add-in will place the backup files. This can be any folder that you can access to from your computer. The backup file for the Plain Text AutoCorrect entries is a simple text file with the name "AuthorTec_PlainText_AC_Entries.txt" and the Formatted AutoCorrect and Formatted AutoText entries are placed in a template file named "AuthorTec_Formatted_AC_Entries.dot". When clicking the "Restore AutoCorrect/AutoText Entries" from the add-in's menu, the first thing you will be asked is to select the folder where the backup files are located. If you are restoring the entries to another computer, then that other computer will need access to the location where you have placed the backup files. With only a few exceptions, the Restore dialog is identical in look and function to the Backup dialog. One obvious difference is instead having the option to Backup AutoCorrects and AutoText, you have the option to Restore these elements. The "All" and "Selective" buttons work the same as they did in the Backup dialog. The other difference is there are three additional checkboxes to consider regarding duplicate entries. When the restore function begins adding the backed-up entries to your existing ACL file and/or Normal template, what if there are duplicates? What do you want the add-in to do? Replace duplicates, or only add entries that are missing? The default is to replace duplicates, but you can override that by unmarking the checkboxes. When you are ready to begin the Restore process, click the OK button. You will be notified when the action is completed. A major difference in AutoText entries versus Formatted AutoCorrect entries is that Formatted AutoCorrect entries are always stored in the Normal.dotm template but Formatted AutoText entries can be stored in any template and not just the Normal template. Why is this important? You may decide when Restoring your backed up Formatted AutoText entries that you want them restored to a custom template and not the Normal template. To do this, open a new document based on your custom template and then begin the Restore function of this add-in. 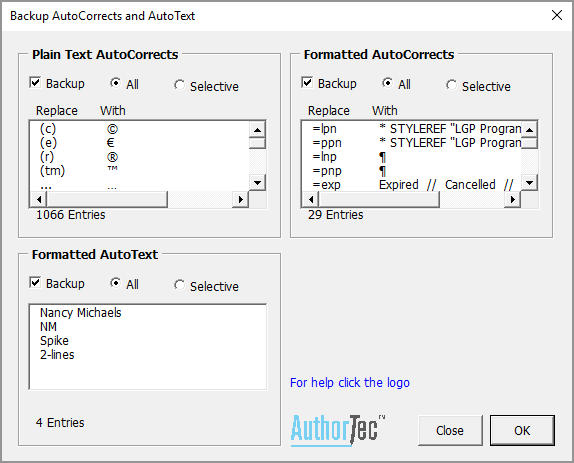 The Formatted AutoText entries that are copied from the backup file "AuthorTec_Formatted_AC_Entries.dot" will be placed into the custom template attached to the open document and they will not be placed into the Normal template. If you want the AutoText entries restored to the Normal template, then just start a New Document and run the Restore function with only this plain blank document open.